China's space agency released an amazingly detailed map of the moon this week, marking the best view yet of the lunar surface as seen by a Chinese spacecraft, according to state officials. The new moon map is made up of many high-resolution photos snapped by China's second lunar probe — the Chang'e 2 orbiter — and stitched together into complete view. 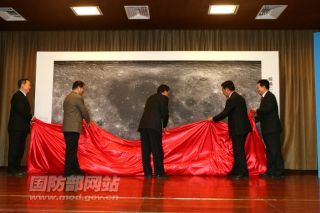 China's State Administration of Science, Technology and Industry for National Defense revealed the moon map during a ceremony on Monday (Feb. 6), and the country's Ministry of National Defense posted the photos on the Web. Liu Dongkui, deputy chief commander of China's lunar probe project, reportedly said the Chang'e 2 lunar map is the highest-resolution view of the moon ever recorded, according to a Xinhua news agency report. The new moon map was assembled from photos taken by Chang'e 2 as it skimmed over the lunar surface at altitudes of between 9 and 62 miles (15 and 100 kilometers) between October 2010 and May 2011 during its primary mission. The photos have a resolution of about 23 feet (7 meters) and are 17 times sharper than the moon photos snapped by China's first lunar orbiter, Chang'e 1. China's lunar exploration efforts are part of a three-phase program named after the mythical Chinese moon goddess Chang'e. The first phase of the program involves orbital reconnaissance of the moon, followed by a robotic lunar landing and later a sample-return mission. The Chang'e 2 mission made a special point of examining a region of the moon's northern hemisphere known as Sinus Iridium (Bay of Rainbows), which is a top contender for China's first robotic moon landing. After completing its primary goals last year, Chang'e 2 left the moon's orbit on an extended mission to explore a deep space. Today, Chang'e 2 is studying the Lagrange point 2, a stable point in space about 932,056 miles (1.5 million kilometers) from Earth on the side of the planet that is opposite the sun.